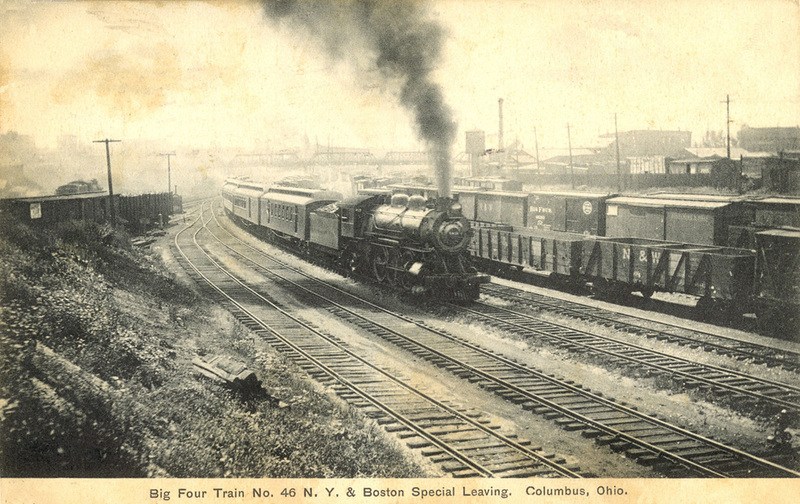 The next nine photo postcards were taken in the early 1900s along the joint PRR/B&O four track mainline on the east side of Columbus. The tour starts at Leonard Avenue and works west past 20th Street, St. Clair Avenue, Cleveland Avenue and ends just before Fourth Street. 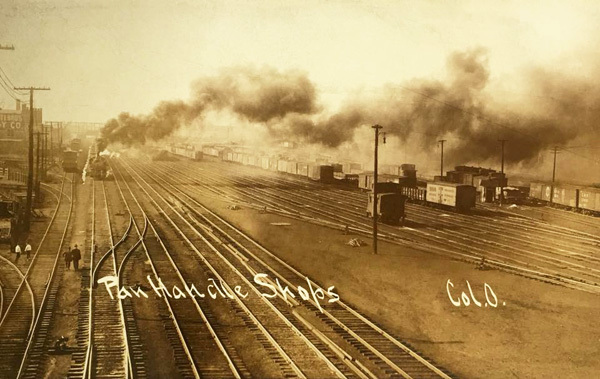 The Pennsylvania Railroad’s 20th Street shops, St Clair Avenue engine house, Yards A and B and numerous industries including the Columbus Stock Yards line the track. Two 1949 aerial photographs of this area may help orientate the reader. For the east end of the scenes depicted in the photographs click here. For the west end click here. In the above photo of the PRR car repair facilities the camera is looking southwest. In the top left a large signal bridge over the four track PRR/B&O main line is visible. Looking further west the 20th Street pedestrian bridge over the main and yard tracks is seen. PRR gondola No. 380867 is visible here and in the following photo. Photo-1 from The Alex Campbell Collection, ca. 1910. The camera is now looking northwest. Gondola No. 380867 is in the right lower corner. 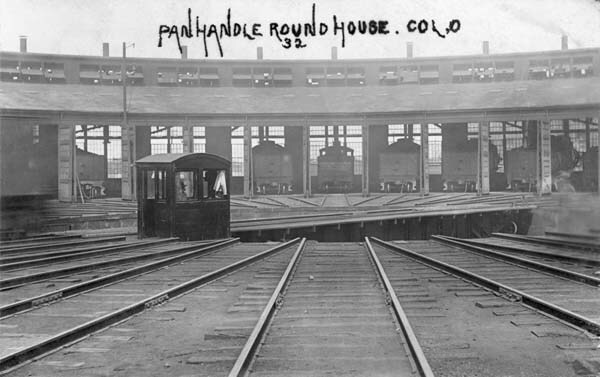 At one time the car department had a round house to shelter while repairing cars. All that is left is the turntable visible on the right-center. Two switchers have a cameo appearance in the photo. A previous owner of the photo must have let their kid decorate the photo with glue and glitter. Not good for posterity. Photo-2 from The Galen Gonser Collection, ca. 1910. The camera is looking northeast toward the 20th Street pedestrian bridge. The large building across the tracks is the PRR blacksmith shop. The rather strange open top cars seem to be gondola cars with added stock car like side and end extensions. The four track main is visable between the two groups of cars. Photo-3 from The Greg Eyler Collection, ca. 1910. This photo was taken from the same spot as photo 3 with the camera now looking northwest. The St. Clair Avenue engine house has an enclosed arch entrance for locomotives to access the turntable. The locomotive smoke has created a haze that obscures the distance. Photo-4 from The Greg Eyler Collection, ca. 1910. A view from inside the St. Clair engine house. As locomotives become bigger a longer turntable will be required and the back wall of the roundhouse will be pushed back. Most of those locomotives nosed into their stalls are probably consolidations the standard freight locomotive of the day. Photo-5 from The Galen Gonser Collection, ca. 1910. Photo 6 is looking east from the St. Clair Avenue bridge. The engine house is left-center behind a wooden fence. Next the Yard “B” receiving tracks leading to the hump with the hump office half way up the grade. The four track PRR/B&O main is empty. In the far distance is the 20th Street pedestrian bridge crossing the yard and main tracks. 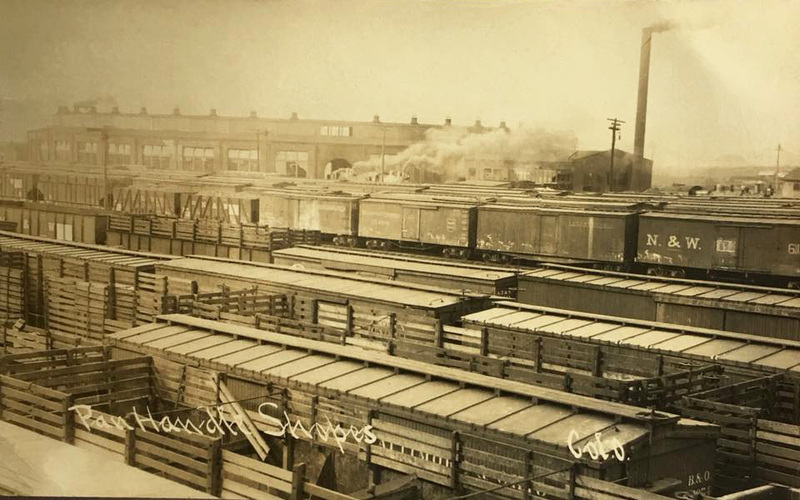 On the right of the main is the Yard “A” receiving tracks. Notice the path worn in the snow going from switch to switch. Photo-6 from The Galen Gonser Collection, ca. 1910. Photos 7 and 8 were taken from the St. Clair Avenue Bridge looking west. Photo 7 is looking down the PRR/B&O four track main. On the right is the Yard “B” classification yard. 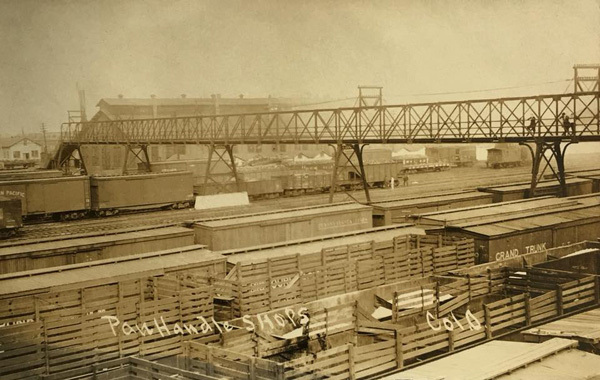 In the far distance can be seen the Cleveland Avenue bridge and behind that the N&W fly over bridge leading to the N&W freight house. The tracks turning south off the leftmost track are serving various business lining the railroad property. Photo-7 from The Greg Eyler Collection, ca. 1910. The photographer has moved north toward the center of the St. Clare Avenue bridge and is still looking west. 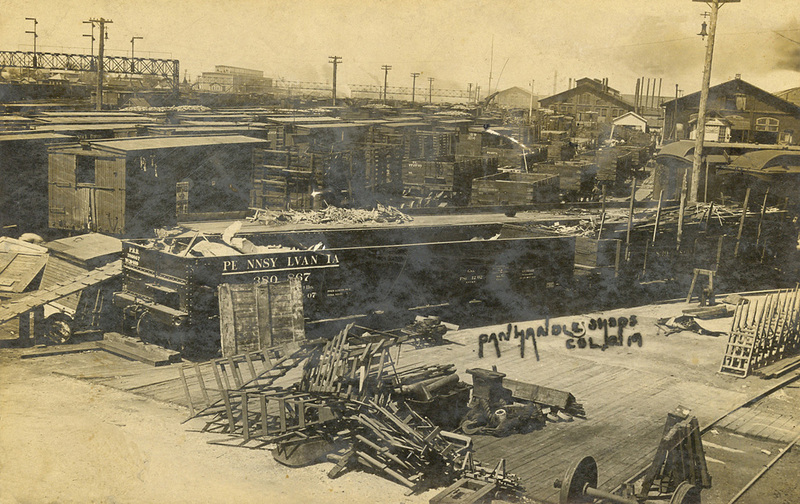 More of the Post Bros Buggy Co. building can be seen on the left-center. There are two switch tender shacks in the forefront. The Cleveland Avenue bridge is visible in the haze. Photo-8 from The Galen Gonser Collection, ca. 1910. 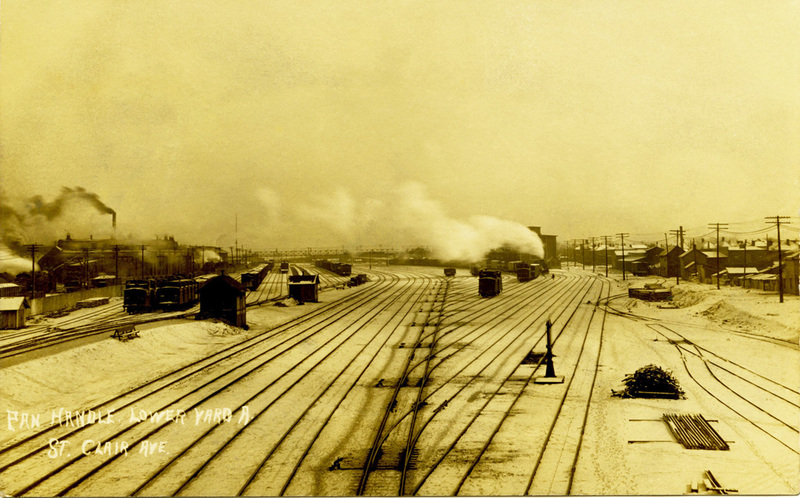 In the early 1900s Yard “B” only extended west to Cleveland Avenue. 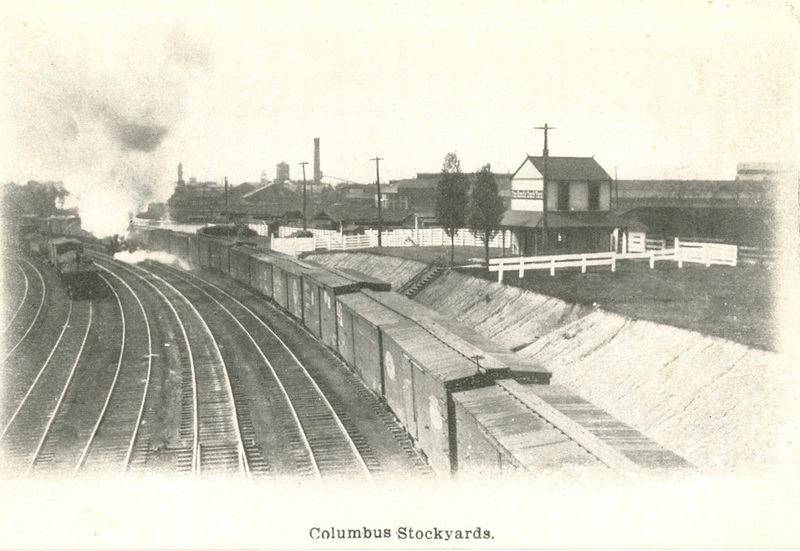 On the west side of Cleveland Avenue was located the Columbus Stock Yard. Later the Stock Yard would be removed and Yard “B” and the CA&C Milo Yard fill this space. These tracks which include the four track PRR/B&O main are curving to the south, leading to Union Station. The Stock Yard was accessible from Cleveland Avenue. Photo-9 from The Alex Campbell Collection, ca. 1910. The Big Four Train No. 46 is curving north headed for Albany, NY where connections can be made for Boston or New York City. The two tracks on the right and the Yard belong to the Big Four. 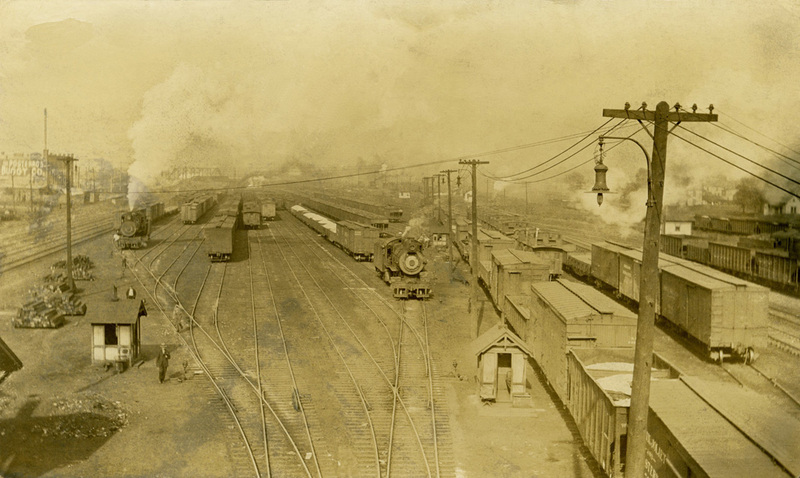 The two tracks on the left are shared by the Cleveland Akron & Columbus and the Norfolk & Western. The Fourth Street Bridge is visible through the haze with the Union Station just beyond the bridge. The PRR/B&O four track main is on the far side of the grassy hill. 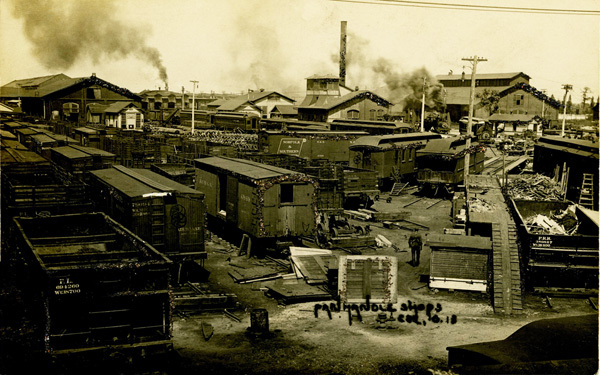 The Stock Yard is behind the camera. Photo-10 from The Alex Campbell Collection, 1907.